I may be slightly too eager with this post – I turned 30 less than a month ago, after all. What could I possibly have learnt in the 27 days since my 30th birthday? Nothing of note, surely? Last week someone asked me ‘how does it feel to be 30?’ and I rolled out my stock answer (honed after many months of being asked how it feels to be married) – ‘exactly the same as being 29!’. But actually, it doesn’t. It feels different. Not in a ‘time to hang up my partying shoes and and buy a slow cooker’ kind of way, but more of an acknowledgement that I’m starting a new decade of my life; one that will probably look very different to the last one. It’s a good feeling – refreshing and restorative. Maybe it’s the combination of a milestone birthday and a new year, but turning 30 has really helped me let some things go. When I ticked over from 29 to 30, I was determined that I wouldn’t spoil my shiny new decade with problems from my 20s. So I made a decision to ‘leave them behind’ – things that weighed me down in my late 20s aren’t coming with me for the next 10 years. I just won’t allow it. At 28, the thought of ‘being too sensible’ struck fear into my impulsive heart. Savings, tax bills, buying a house, fixing the car, sorting the cellar out, doing the glass recycling – all these things were (and tbh, still are) intolerably dull. The difference now is, I recognise the importance of boring, sensible things. It’s the one thing that just suddenly clicked – like I couldn’t bear to be a 30 year old woman with six months of glass recycling festering in the garden. My 30th birthday was a big event with lots of celebration (what can I say, I’m a drama queen) and my family and friends went way beyond to make it special for me. Being surrounded by people who make you feel entirely loved is the best thing in life, and there’s no room for anyone who doesn’t. Leave those behind in your 20s – they’re clearly not Your People. For me, turning 30 was a career milestone. With a whole new decade stretching out in front of me, I’ve started to seriously think about what I want to be doing in 5/10 years time… and it’s probably not what I’m doing right now. That doesn’t mean I’m packing it all in (don’t worry, clients! ), but while I spent my 20s working towards a very specific career goal, I now feel like I have more options. I don’t have to continue on this linear career path – I can make small changes, try other things, start from the bottom. I’m not worried about ‘losing my place’ on the ladder while I step down to do something new. And the prospect of that is way more exciting than Instagram likes. So that’s it – five things I’ve learnt since turning 30. They’re all pretty personal to me, and they account for the privilege I have to do things like try a new career path or leave problems behind – I know not everyone is in the same situation. 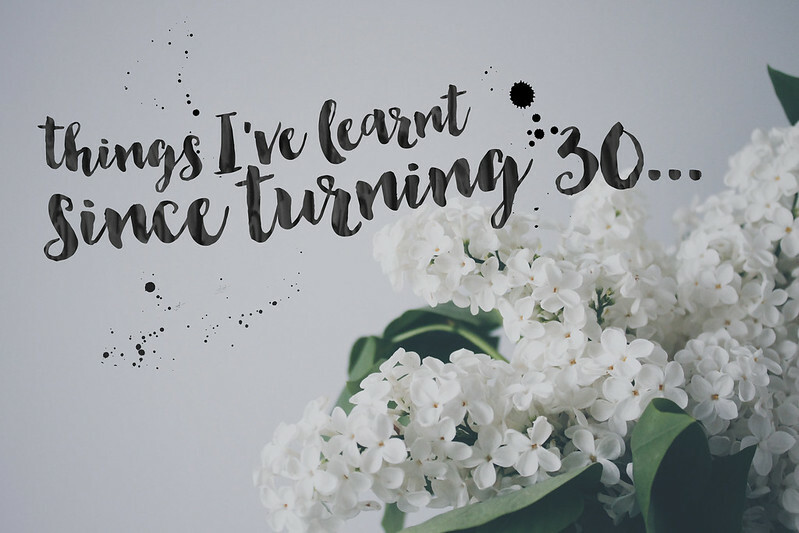 I’m planning to update this post with my progress and more things I’ve learnt as the year goes on – a timeline of turning 30, if you will! If you’re celebrating a milestone birthday or you have one coming up, I’d love to know what you’ve learnt – share your thoughts in the comments. Turned 30 in September. Love it. Feels like yes, this is it now! Every birthday feels like ‘level up’ and a decade is like a boss level. Very awesome. A couple of years ago one if my friends died soon after her 30th. It was devastating. It reminded me that it’s a privilege to get older. I am turning 30 this September and I keep saying to people that I am 30 already-which is so unfair for my 29th year! I hope I get it alright and not be too much depressed! This is a really lovely post and its great that you decided to do it soon after your birthday as you can reflect just before you turn 31.